I snuck away from the baby just long enough to attend one day of the annual three day #DoleSummit in Westlake Village. 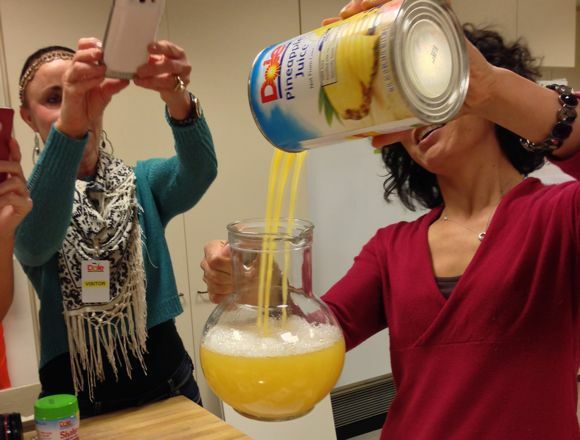 Along with a handful of other bloggers from around the country, I tried all kinds of new Dole products in the Test Kitchen and learned a thing or two about the company and its people. And just because Lists are almost as fun as Dole Whips, here are my Top 10 Fun Facts from #DoleSummit 2014! But before I forget (you know this mommy brain thing is real), I’ll suggest that you enter the Dole Cook-Off! I sous-cheffed last year and it was a blast. 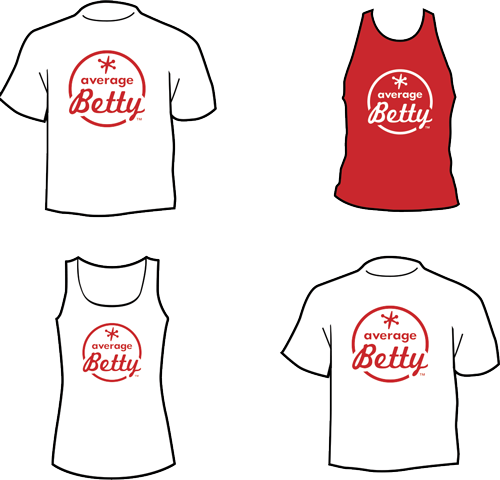 Aside from all that, you could win $25,000. 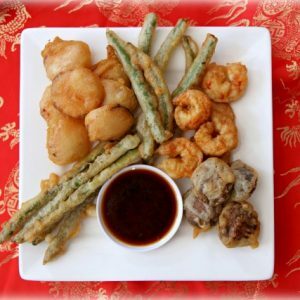 So, fire up your grill and get creative with Dole products! Never mind the outdoor seating and waterfalls. Yes, waterfalls. The Dole Cafeteria has some of the best salsa I’ve ever tasted. 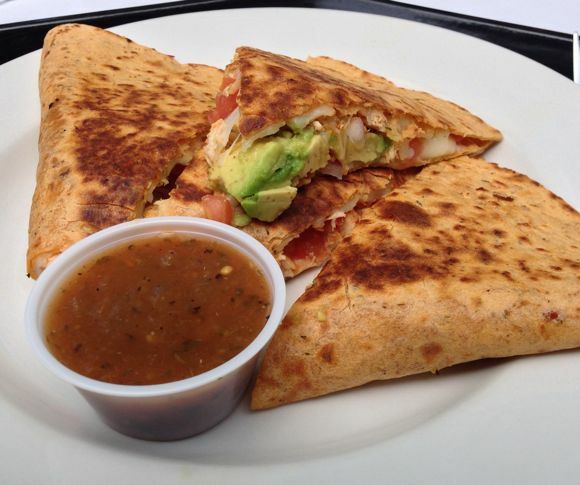 And their Grilled Chicken Quesadilla is loaded with beautiful, fresh avocado. How do I get that salsa recipe, I wonder? 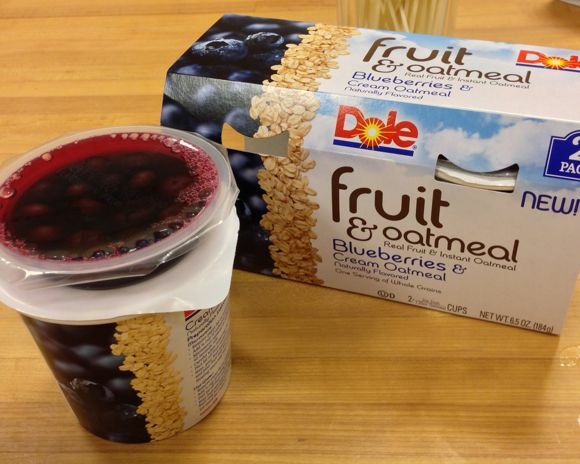 Fruit & Oatmeal is one of my favorite new Dole products. 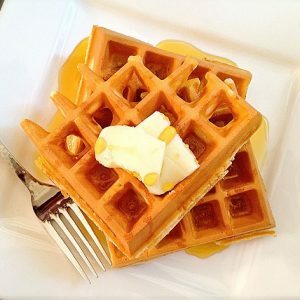 I mean, you know I’m a sucker for Oatmeal. 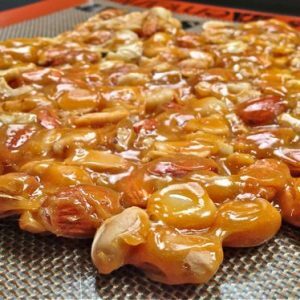 Although this isn’t a product I’d buy to eat at home, it’s a perfect treat for when you’re on the go. Tastes just like a Blueberry Crisp! 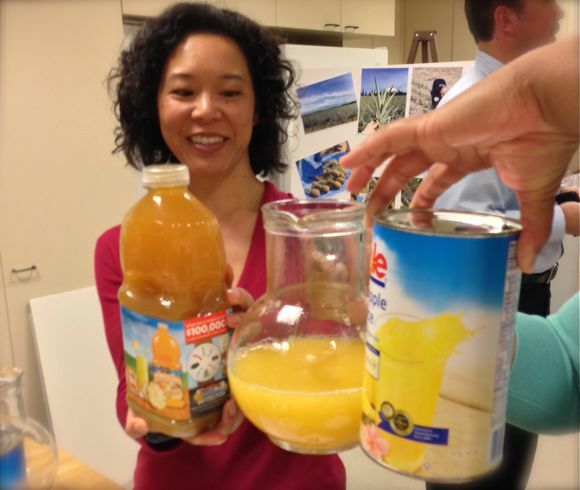 Dole juices are packaged in metal cans to protect from light. And this coat of armor doesn’t just help keep that vibrant yellow color, it also helps retain nutrients. Dole uses Monk Fruit to sweeten its no sugar added fruit bowls. Who knew? All Dole products are GMO free. Well, except the papaya products. Way to go papaya. 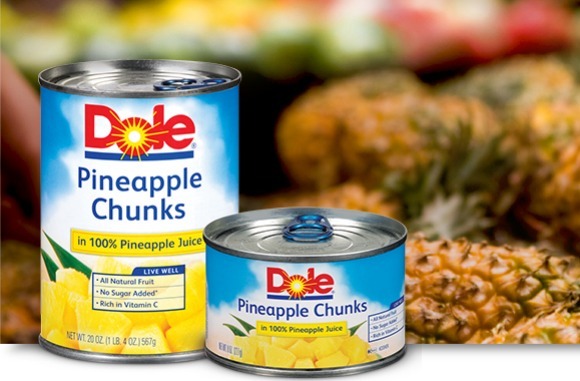 And Canned Pineapple Chunks are the best selling canned Dole product. It takes 18 months to grow a pineapple. Pineapples are grown from the top (or crown) of another pineapple. 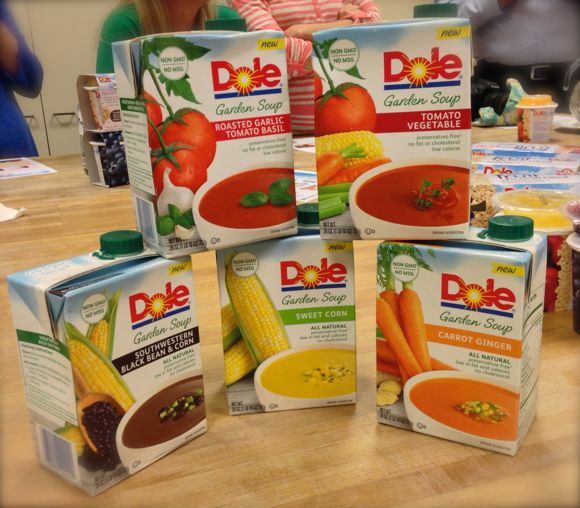 New (and I do mean new – they aren’t even on the market yet, so look out for them) Dole Soups are fresh tasting, ready to eat, and full of ingredients you can actually pronounce… Soup’s on! All those years bartending in college and I never learned this technique. Punch three holes with a church key on one side of the can instead of one on each side and you’ll have a pineapple juice waterfall to impress your friends. In 2012, Dole acquired Mrs. May’s Natural Products. And while I couldn’t control myself around the Dark Chocolate Covered Strawberries, it was the Trio Bars that I really noticed. 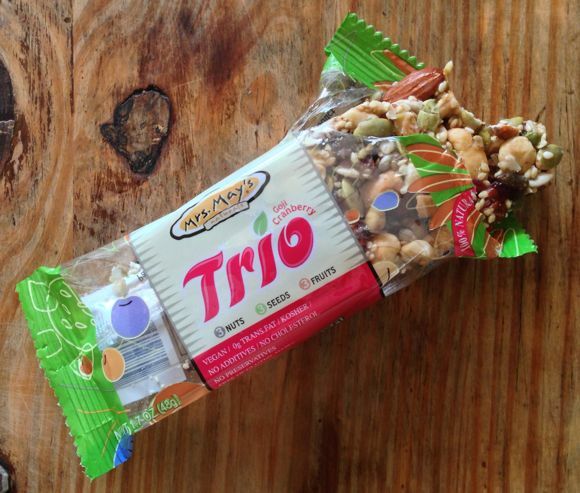 Crunchy flavor combinations, vegan, peanut free and 100% snack-worthy. 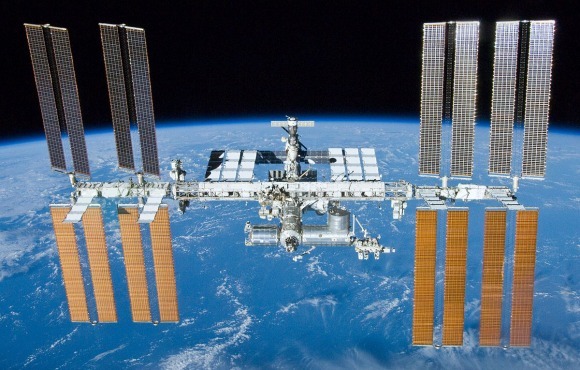 Dole Squish’ems are at the International Space Station. I surrender my nerd flag. Special thanks to Dole and Finn Partners for sponsoring my attendance at the 2014 Dole Summit. Dole is a leader in sourcing, processing, distributing and marketing fruit products and healthy snacks throughout the world with a full line of canned, jarred, cup, frozen and dried fruit products. For more information please visit www.dole.com. I loved this post, partly because I too love lists and also because I am with you on some of these highlights! Now I only wish I would have tried the salsa!